The Baton Rouge BeignYAYs troupe will perform at the Spanish Town parade, Mid City Gras and make its debut at the Krewe of Artemis parade. Photos by Collin Richie. The St. Amant High School art teacher enjoys dancing and has had a passion for costuming since she can remember. In 2017, she combined those passions to start the Baton Rouge BeignYAYs. Before she knew it, the group was performing and marching in local parades like the Spanish Town Parade, Mid City Gras and the Baton Rouge Halloween Parade. What started as a four-person team quickly grew to 40 members. The Baton Rouge BeignYAYs represents a melting pot of women of all ages and backgrounds—they are nurses, teachers, small business owners, librarians and stay-at-home-mothers. Because of their busy schedules, they meet in the evenings to prep for the parades. But it’s not all sparkles, fringe and high kicks for the BeignYAYs—there’s a lot of work that goes into the performances. Two months before a parade, the group meets once a week to practice choreography. They practice everywhere from dance studios to school parking lots. As team captain, Newsom creates most of the dance routines, but other members contribute moves as well. Newsom usually starts by picking out a song she likes and finds dance inspiration from watching shows like Soul Train until she strings together a full routine. Her favorite part of preparing for the performances is designing the costumes in the group’s signature teal and gold. The BeignYAYs make their own costumes using unique pieces from vintage boutiques, thrift shops and online stores. 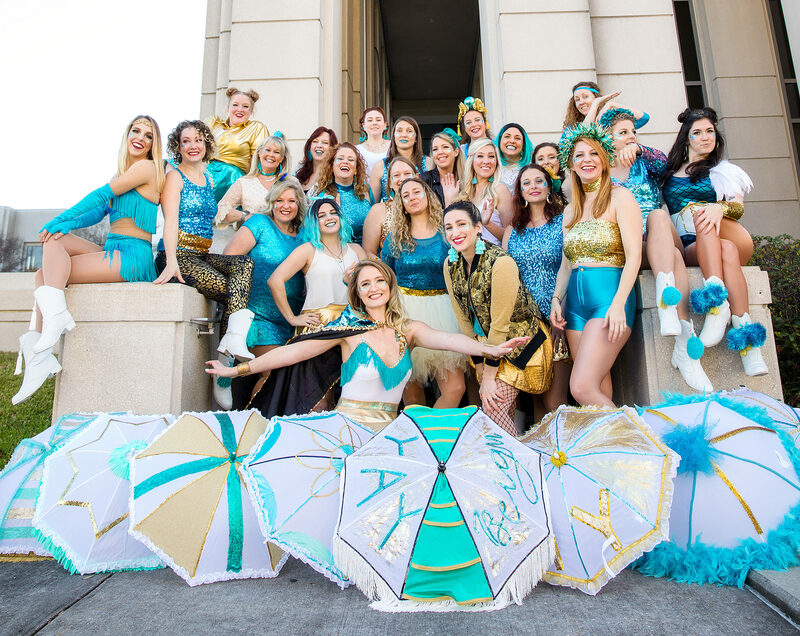 Donning metallic gold skirts and sparkling teal tops, they finish the looks with some second-line flair: customized umbrellas for each parade, topped with sequins, tulle and feathers. In the past, the team has allowed any local dance enthusiast to join the all-women’s dance troupe. In the future, Newsom plans to organize a more formal try-out process open to anyone. As the Baton Rouge BeignYAYs enters its second year of dancing, the group will return to local parades like Mid City Gras and the Spanish Town parade, as well as make its debut appearance at the Krewe of Artemis parade. In the future, Newsom wants to make Baton Rouge BeignYAYs a non-profit organization so it can fundraise and donate to local causes. She also hopes to encourage others to start more dance troupes, she says—there is always room for more in Baton Rouge. This article was originally published in the February 2018 issue of 225 Magazine.